Apparently, the British invasion of the Algarve is all the fault of Sir Cliff Richard. According to the commentary on the bus tour, it was Cliff (as he was back then) who 'discovered' this part of the World in the early sixties, and it was his passion and indeed promotion the area that started the waves of tourists that now flock to Faro Airport by the thousands on an annual basis. They like Cliff a lot in the Algarve, and in particular in the Albufeira area where he has a home and a vineyard. A street in the town is called Rua Sir Cliff Richard, and you don't have to walk far to see a giant cardboard cut out of the man promoting his own brand of wine. 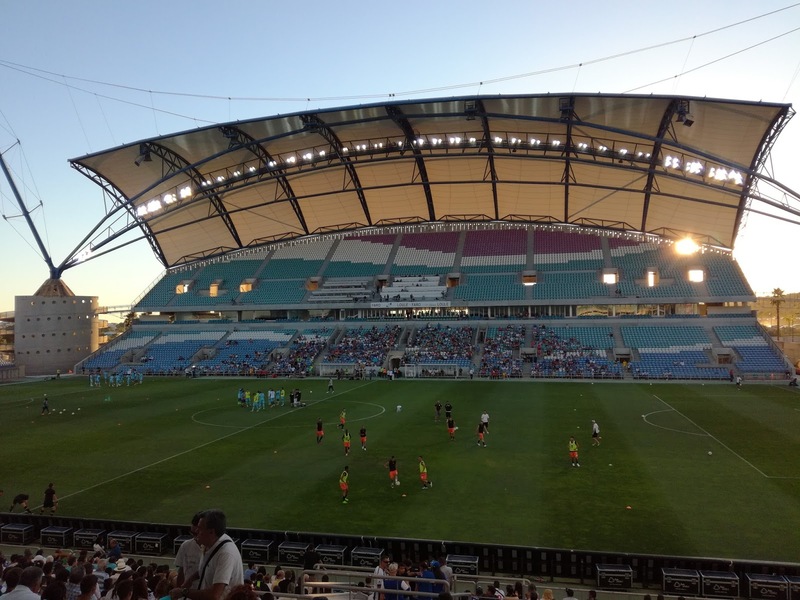 Relations between Britain and Portugal remain strong and tourism plays a significant part in that, but events in the football arena did threaten to put a slight spanner in the works. Jose Mourinho famously danced down the touchline at Old Trafford as FC Porto dramatically ended the Champions League hopes of Manchester United, only to suddenly find himself in the hot seat at Stamford Bridge, it was going to be fun. The 'Special One' was Marmite, some loved him, some hated him, was he the image of Portugal we really wanted to see, and was he the image that Portugal indeed wanted us to see? Again, open to debate. But, it all really kicked off in the Summer of 2006 when England played Portugal in the Quarter Final of the World Cup. Wayne Rooney accidentally stamped on Ricardo Carvalho, it all got a bit heated and Cristiano Ronaldo stuck his oar into the proceedings and was viewed by many as being responsible for Rooney's subsequent red card. But what happened next threatened to cause an international incident, Ronaldo was captured winking towards a team mate as Rooney left the field, as though to suggest he had managed to influence the decision. Outcry, outrage, Ronaldo must never be allowed back into the Country, and even if he did, Rooney would have the nations support to dismember him in full public view. Oh, and we lost on penalties of course. It calmed down, as it always does, and relations to this day remain intact and indeed very strong indeed. It's a good job really, Sir Cliff's wine business would be shafted otherwise! 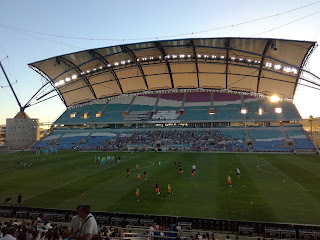 Anyway, I spotted that local side Portimonense were scheduled to play FC Porto in a friendly fixture at the Algarve Stadium on the Thursday night of our holiday, but, wherever I looked I could find no way of how to obtain tickets. Surely though it couldn't be that hard? It didn't turn out to be that simple, after the two of us spent some time online, it appeared getting tickets meant a trip to a local Post Office who it also appeared were the only outlet for tickets, and then you had to be registered and have an account. Angelo took care of that though, he went out of his way on a half days holiday to sort it out, what a great thing to do. 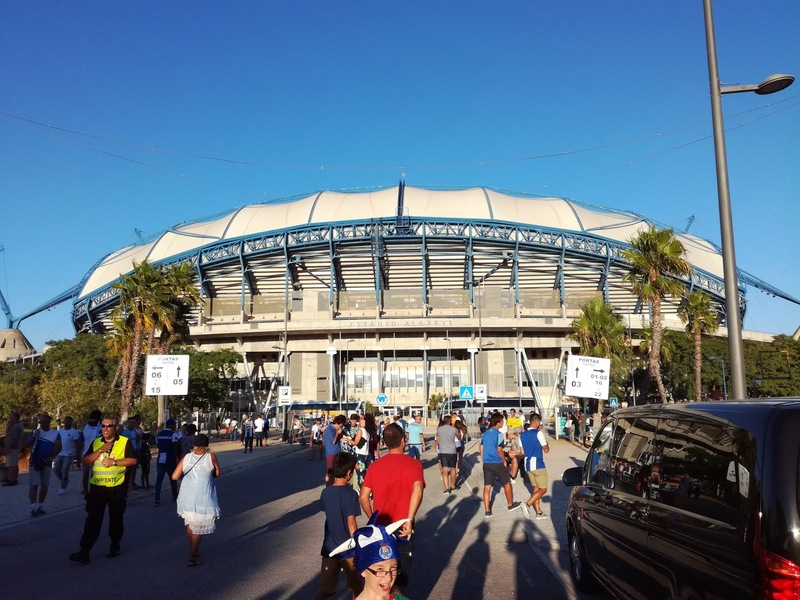 On the day of the game, we were picked up from the Reception of our resort and driven the 35 minutes to the Algarve Stadium. 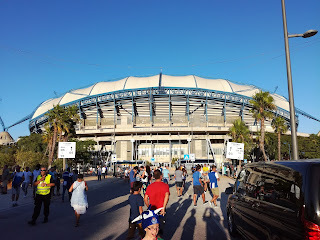 We talked football, tourism, Portugal, hopes and plans, all things really, the journey flew by, and soon we were parked up outside the ground that was built specifically for the European Championships. But, while it may be a fine stadium, it is something of a white elephant. 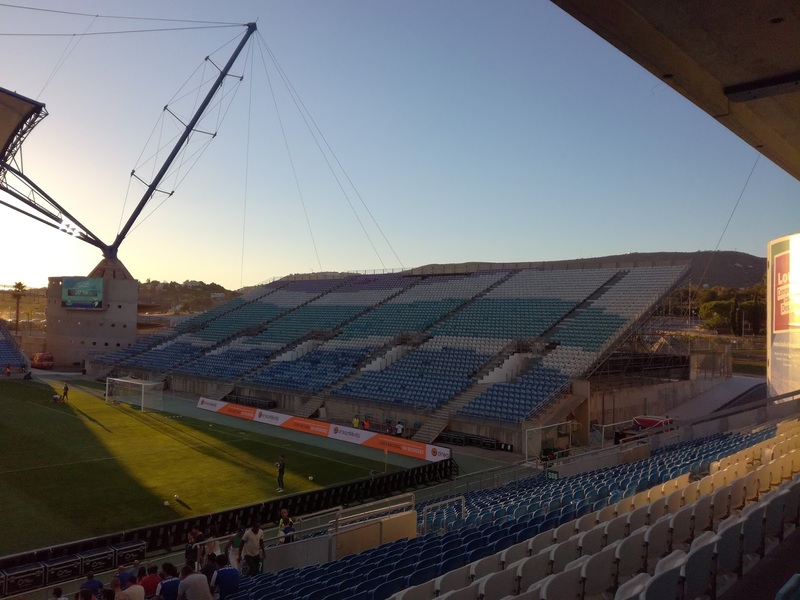 Initially it was thought Farense would use it as a home ground but as they fell on hard times it was clearly not practical for that to happen. So, it is not used as a home ground by any club sides, and isn't likely to be any time in the future. 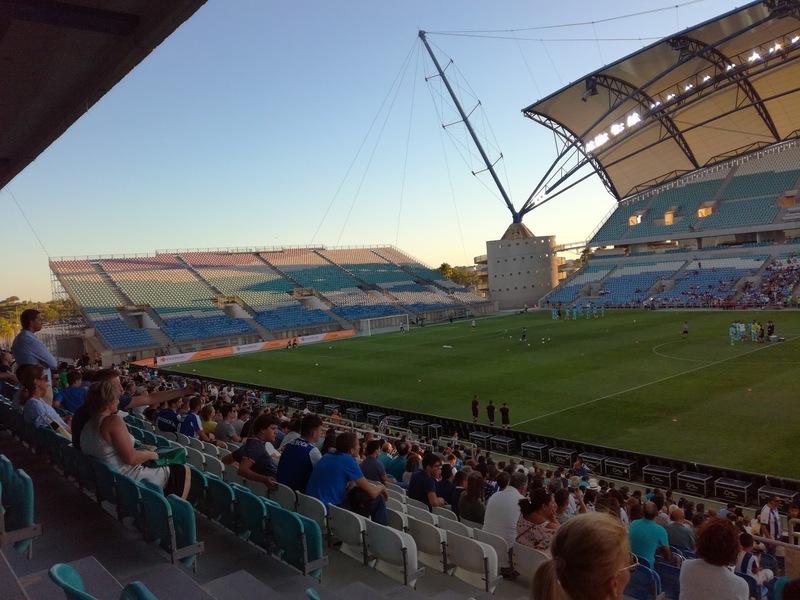 It is used for friendlies, the odd international, and for the occasional tournament, but otherwise it is an expensive 28,000 seater modern facility that is vastly underused. The FC Porto fans were in big number, a crowd of around 7,000 were in attendance and the vast majority were followers of the side 500 kilometers to the North. To be fair though, they attract support from all over Portugal, and of course many would have been on holiday in the area also. 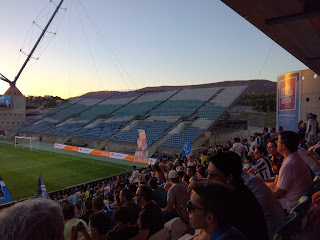 That said, the support was superb and the atmosphere they created was tremendous, but at that same time friendly. We sat just to the side of the 'Ultras' and the show they put on with their flags and the choreography orchestrated by the chap with the megaphone was something you would only see in Southern Europe. The game was very one sided. FC Porto raced into a 3-0 lead with the utmost of ease, but then the newly promoted side from Portimao did pull a first half goal back. To be fair though, the gulf in class was huge, but I guess in a league where three sides dominate and the rest simply jockey for position or try to survive, that isn't a huge surprise. Two more goals followed in the second period as the sun set and floodlights lit up the pitch at the Algarve Stadium. 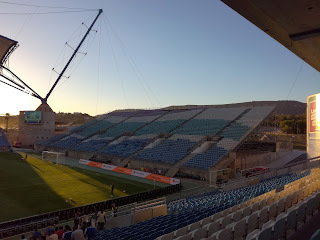 It is a very impressive stadium, two large stands on either side of the pitch with arched roofs, while behind either goals were open banks of seating, albeit they did look somewhat temporary (think Gillingham!). The ground is set in the middle of nowhere on the West side of Faro, but the car parks are large and the road links are good, almost perfect for say a large sporting tournament?? 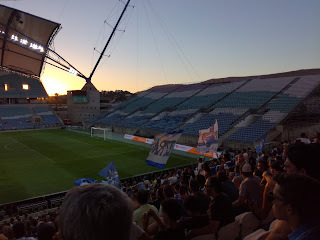 We got away with relative ease at the end, and again the talk flowed, but more about football and specifically Angelo's passion for FC Porto (his favourite all time player being Deco). We were dropped safely at our resort and bade farewell. What a great evening, but all thanks to Angelo who went above and beyond in terms of his duties. But, we had a common bond, and that was football, and even if that did threaten to split our two nations in the Summer of 2006, our great national sports will only ever be a unifying force. Obrigados Angelo Ribeiro, você ajudou a tornar nossas férias muito especiais! I'm sure Sir Cliff would agree!